Is Keith Harris, 44, truck driver, for real? Harris is accused of handling stolen goods — twelve 40-ft containers worth $120,000, and 150 sheets of plywood, and stealing $5,000 from Arturo Matus; he owes rent, owes Joseph and Taylor, owes $983 to BTALCO and $5,530 to Monica Pawn Shop; and wrote bad check for $1,092! Keith Harris, 44, a truck driver of #124 Freetown Road, was today arraigned in Magistrate’s Court #2 for theft. 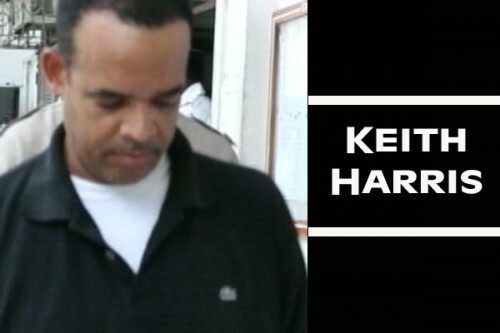 According to a report made to police, Harris stole a computer from his friend, Maria Belizaire. Belizaire told police that on December 3, 2012, she loaned her HP brand laptop computer to Harris. However, when she asked Harris for it, he told her that it was at a friend’s house being fixed. Belizaire alleges that for the past 3 weeks, she has been trying to retrieve her laptop from Harris, but all her attempts, so far, have been futile. Harris finally gave Belizaire the phone number of the friend he alleged had the computer, but when she called the number, the person told her that he did not have the computer. After going through a back-and-forth with Harris over the computer, she decided to make a report to police. In court today, Harris told Senior Magistrate Sharon Frazer that he and Belizaire had had a “falling out” and that was when she told him that she would make the report of theft to the police. He further stated that he was surprised to know that Belizaire would resort to such low levels as to make a report against him, but that his family is working on returning the computer to her as early as today. Harris was unrepresented in court when he appeared today and pleaded not guilty to the charge. Senior Magistrate Frazer then offered him bail of $1,500 and one surety of the same, and his matter was adjourned to February 6, 2013. Harris was unable to meet his bail by midday, but that was the least of his woes. At 2:00 this afternoon, he was returned to the court of Chief Magistrate Ann-Marie Smith, where a slew of charges were read to him. Firstly, he was read a charge of theft, in relation to a report made to police that he stole $2,500 from Arturo Matus on October 5, 2012, and again on October 8, 2012. He was then read a charge of handling stolen goods. Police say that on October 27, 2012, Harris assisted in the disposal of 100 sheets of 3/8″ plywood, and 50 more sheets of plywood, the property of Caribbean Tires, totaling $9,466.88 in value. Harris, again unrepresented, pleaded not guilty to the charges and was offered bail of $1,000, $500 of which was to be cash, and the balance a surety. Then Harris was read two more charges of theft and handling stolen goods, but this time, it was for some storage containers. Police say that on October 5 and 8, 2012, Harris stole a total of (12) 40’ containers, the property of Marine Services and Company Limited, valuing $10,000 each; the amount was $120,000 for all 12 containers. These matters were treated as indictable matters and so no pleas were taken from Harris for them. He was offered bail of $1,000, but in cash, and his adjournment date for these charges is February 6, 2013, as well. No conditions were applied to his bail from this morning with the Senior Magistrate, but this afternoon, the Chief Magistrate went ahead and applied conditions on all of the bails that were offered to him. One condition is that he must hand over his passport to the Clerk of Court. Harris told the court that he had misplaced his passport and was in the process of trying to obtain another. Chief Magistrate Smith then informed him that he cannot apply for a new passport; he must stay away from all the virtual complainants in these matters; he must report to the Queen Street Police Station every Monday between the hours of 7:00 a.m. and 7:00 p.m.; and he must notify the police if he moves from his Freetown Road address. But Harris’ day got worse, as on the court book, his address was listed as #122 Curassow Street. He was unable to verify exactly which one of the addresses was his place of residence, and so, all of the bail that was previously offered to him was revoked. And if he thought his day couldn’t get any worse, it did when 5 civil matters were then addressed in the court against him. The first was for Umesh Mahitani, who told the court today that Harris owed him for unpaid rent for his residential property in Buttonwood Bay. Harris was renting the house from him, but failed to pay rent for 1 ½ months. Mahitani had taken Harris to court, and in October an order was made by Magistrate Kathleen Lewis for him to pay Mahitani. But up to today, no money had been paid to Mahitani, and so today, Harris was ordered to pay Mahitani $1,000 forthwith, or go to jail. The second civil matter was taken out against him by Joseph & Taylor; however, the amount was not disclosed to the court, since the owner of that establishment had called and asked that the matter be stood down until he, the owner, could appear in court. Then they moved on to Caribbean Tires; Harris had written a cheque to the company on November 12, 2011, but that cheque bounced and they had sued him for the amount. An order was made that Harris pay them the total of the cheque, $1,092, but, just as with Mahitani, no payments were made to them. When asked if they wanted to wait to collect their money from Harris, the representative from that company told the court no. So, for this civil matter, he was remanded. BTALCO was up next and they were owed $983. Harris had been ordered to pay them $100 by November 30, 2012, but, again, no payment was made to them. They told the court that they are willing to wait to collect their money, since Harris will be remanded for some time. Finally, it was time for Monica’s Pawn Shop, where Harris racked up a bill of $5,530. And in their order against Harris, he was ordered to pay them $5,000, but he was committed to the Hattieville Prison for non-payment of this as well. Amandala has learned from a reliable source that another woman has a committal warrant out for Harris, as she is claiming that Harris has her laptop computer and her digital camera, none of which has been returned to her. In court, Harris said that he was in a business deal with some foreign investors and they were to wire $80,000 US for him. That money, he told the court, was what he would have used to pay off these debts, but the investors, after learning of his financial woes, decided against it. Harris, whose birthday will be on December 28, will be spending that day behind bars at the Hattieville Prison, because as was mentioned above, he is remanded until his next court appearance on February 6, 2013.